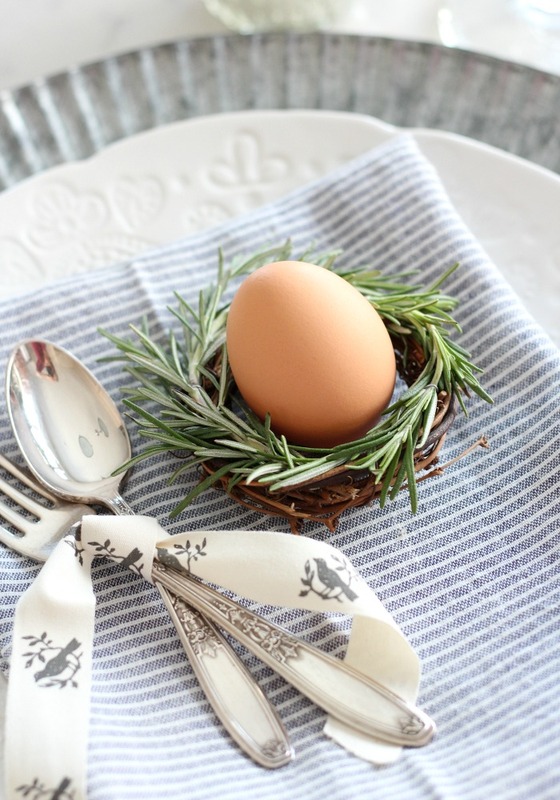 Mini rosemary wreaths are a creative and pretty way to dress up any Spring table. 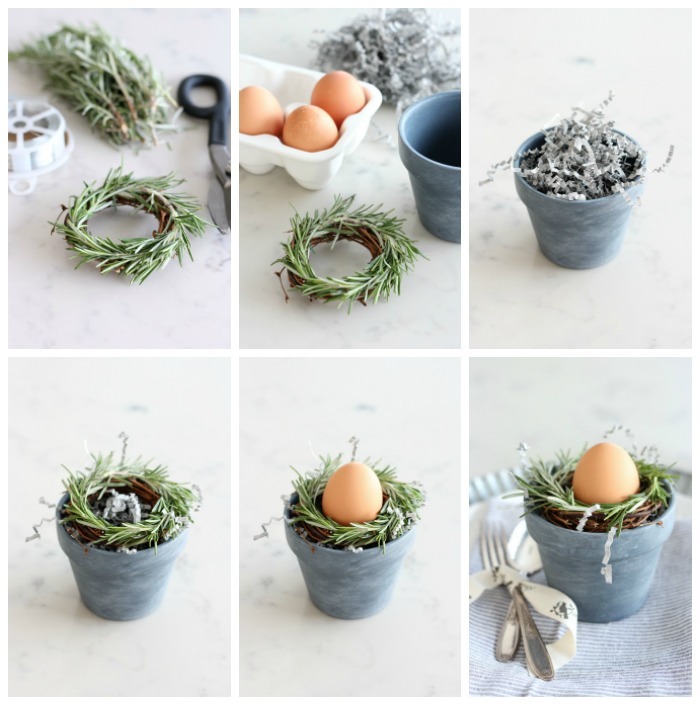 See how simple they are to make along with more Spring wreath ideas. Happy Spring! The birds are chirping and the sun is shining. Could it get any better? Today, I’m joining my friend Krista in her Seasonal Simplicity series sharing an easy Spring wreath along with all kinds of other wreath projects by some of my favourite bloggers. Easter is around the corner, so I thought I’d make some decorations for our table. Of course, these wreaths are perfect for any Spring get-together or party. You could even send one home with each of your guests. Did you know rosemary symbolizes loyalty and friendship? No wonder it’s one of my favourite herbs. 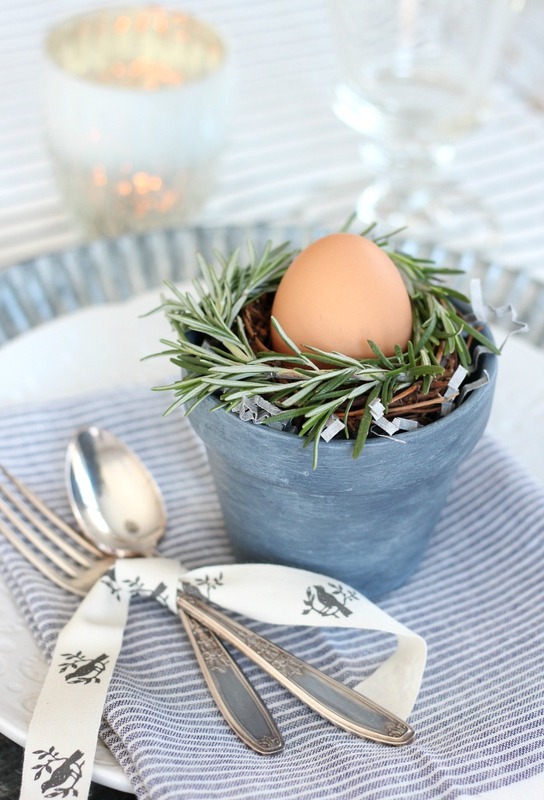 As an afterthought, adding names to the eggs as place card holders would’ve be fun too. I think I may do that for Easter Sunday. Better brush up on my calligraphy skills! Although I set my mini rosemary wreaths in pots for a bit of height, they look pretty on their own too. They work well as Easter egg holders. Do you decorate eggs? Sadly, it’s been a few years for me, so it’s definitely time to give it a whirl! You may recognize the concrete painted pots from my indoor herb garden I put together last Spring. Any small pot will work. Just make sure your wreath will fit in the top. 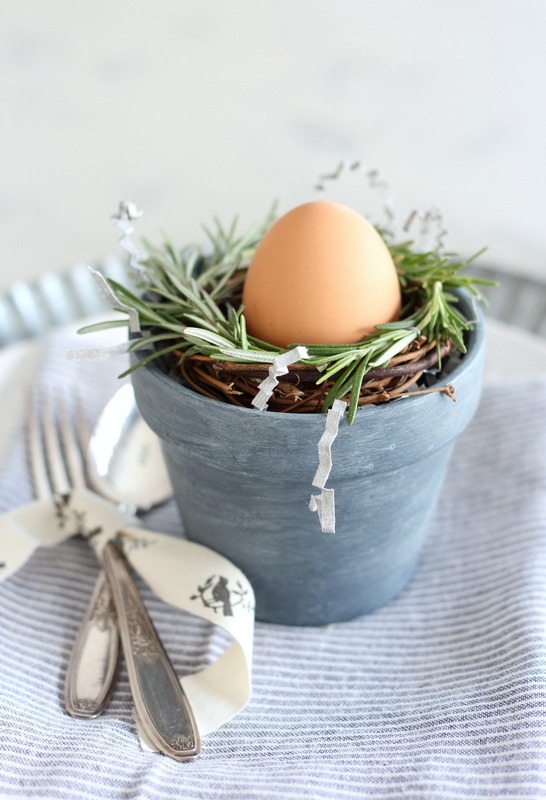 These mini rosemary wreaths are super easy to make. Start by tucking the end of a rosemary sprig into the grapevine wreath. Bend the rosemary to follow the curve using wire to keep in place as you go around. I twisted mine at the back and used wire cutters to trim the excess. You may need to add more than one sprig depending on the length and fullness. Once you have your wreaths constructed, fill each pot with crinkle paper. Finally, top with wreath followed by an egg. Easy peasy! I think they tie in nicely with the bird ribbon I added to my table. It’s similar to the bee print I used on my Nature Inspired Easter Table that I decorated with wheatgrass peat pots and tulips. Like those fringe napkins? You can find them here. 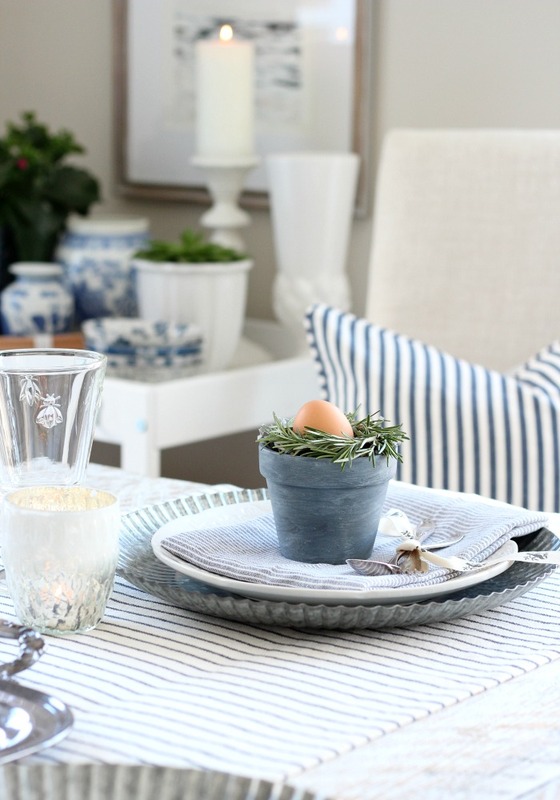 Be sure to pin this Spring table decor project for later! Started decorating for Spring yet? Here are some lovely ideas to get you on your way. 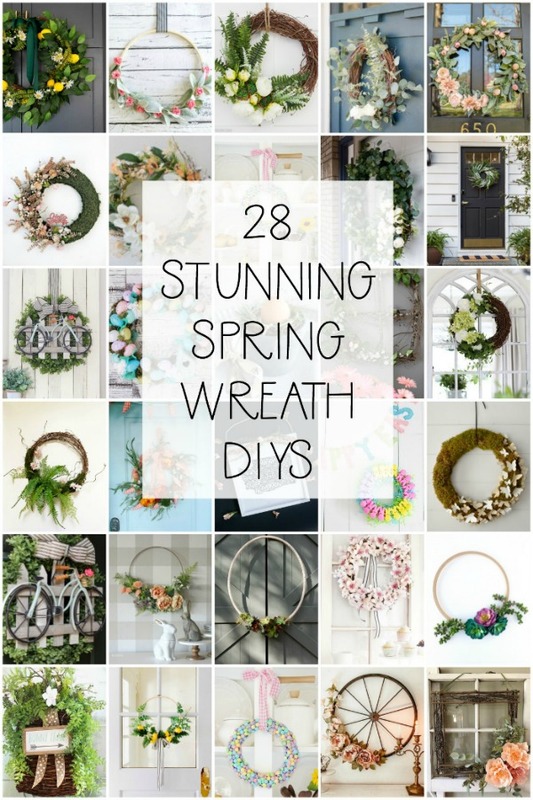 I’ve joined up with a talented group of bloggers to share a Spring wreath project. Enjoy! Your mini wreaths are beautiful and look so delicate! Pure perfection, happy Spring! These are THE cutest, Shauna! 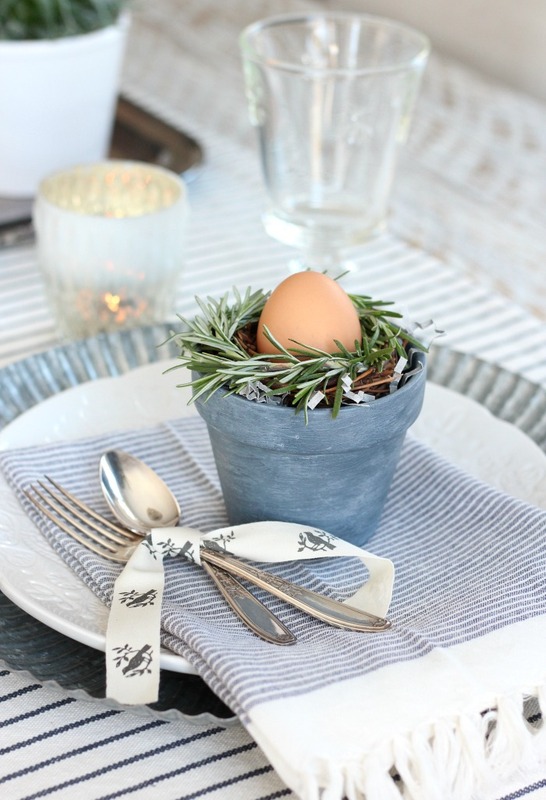 What a great idea for an Easter table setting…love this so much. 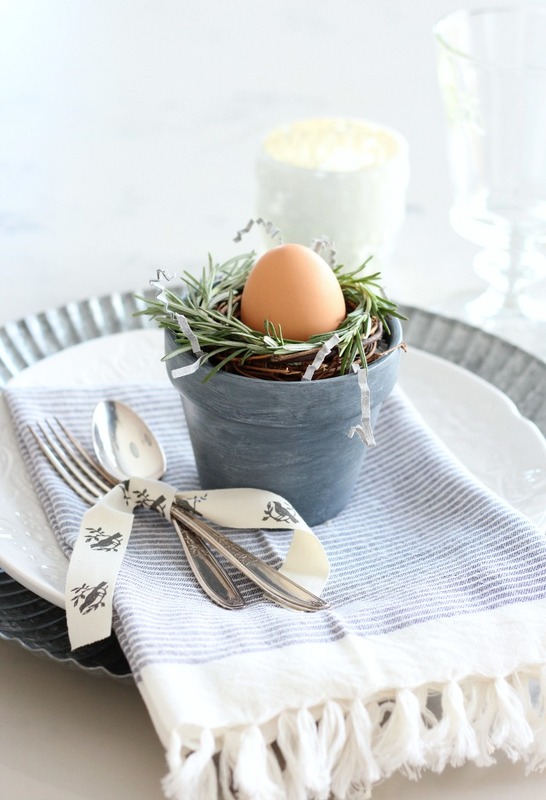 Those are the most adorable wreaths for a Spring table. Thanks for sharing Shauna! Shauna, what a lovely idea. Your table is the perfect balance between elegant and casual. It’s so fun participating in this series with you! I’ve pinned your project to my favorite Easter board to share with others! This is so simple, sweet and elegant. I love how you tied the utensils as well. Pinning. What a neat idea! Love this so much, Shauna! These are so adorable! Love your tablescape.